I am writing this article for multiple reasons. On the one hand I want to push my little baby compress-or-die.com (that I will call COD in the rest of the article). It is in my opinion THE tool to create JPGs with the best file-size/quality ratio. On the other hand there are so many incorrect statements about the JPG format out there and therefore so many wrong tool comparisons, that it is simply important to me to clear up misconceptions with an explanation that is reasonable for every level of understanding. To make this possible I will overly simplify some aspects for the purpose of answering questions adequately if not perfectly correctly. For example I will presume that a color image has an 8 bit resolution, although the JPG format supports other resolutions. After reading this article you should understand the functionality of the JPG algorithm. Therefrom it should be clear how the file-size reduction tricks explained at the end of the article work. Furthermore it should be clear to you why compression tools without settings can only achieve a fraction of the possible file-size reduction. By the way COD was created to increase maneuverability in digital advertising banners which usually have size-limits somewhere below 200 kB. Of course you can also use COD for large photographies (2,000px x 2,000px und bigger), but at very large sizes it is often not important to save 20 or 30 kB. In this case you could use nearly every tool to compress your images. It gets really interesting when you try to gain the biggest savings at very low qualities. Before we start I want to mention something you should take into account if you compare file sizes. Assume you've got a JPG from tool XY and the file has 2,350,195 bytes. Depending on the tool you will get different sizes displayed in kB (https://en.wikipedia.org/wiki/Kilobyte). The well known tool JPGMini uses the deprecated mode of calculation (1024 bytes corresponds to a kB) and displays 2,295 kB. Since 1998 the correct way to declare that way to calculate would be with "KiB". COD uses the correct mode of calculation (1000 bytes corresponds to a kB) und displays 2,350 kB for the same file. Depending on your operating system or your program you will see either one or the other value. There is utter chaos. Generally the tendency is to use a system that makes the product appear better. For this reason JPGMini uses the deprecated mode of calculation... and manufacturers of hard disk drives use the new one because their drive's file-size appears to be bigger. If you compare file-sizes from different tools you should download the files and compare them at byte level to get a fairer comparison. Most of the time your images will be in the RGB color model. That means they will be displayed on your monitor by the three colors (or channels) red, green and blue. If a pixel should be displayed white, all three colors are illuminated simultaneously. With the correct mixing of red, green and blue light many different colors can be displayed. And because every color can be dimmed in 256 steps it is possible to display 16.7 (256^3) million colors within the RGB color model. A white pixel means the color is shining as bright as possible (with the value 256). If a color does not exist at a specific point the value for this pixel is 0, so we see a black pixel. As you can see Lena is recognizable very well on all three images. 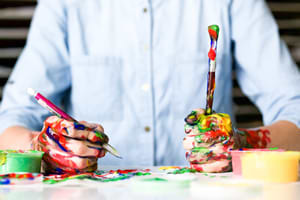 So every color channel contributes to the overall impression of the image. In this image the red channel is a little bit more distinctive because the Lena image has a tinge of red. You can see that the lightness channel (Y) contributes very much to the overall impression of the image while the other (color) channels (Cb and Cr) show the image content less well. If the contrast is stronger and the source image is more recognizable, then there is more information included, that is important for the image. The reduction of the color data is called Chroma Subsampling or Color Subsampling. There are multiple possibilities to adjust this reduction. But common for JPGs is either to reduce the color information to a quarter (called 2x2 or 4:2:0) or to keep the color information (called 1x1 or 4:4:4). These are also the settings that are offered to you in COD. With Adobe Photoshop it is not possible to adjust the Color Subsampling, it is automatically set. When an image quality between 100-51 1x1 is set, then Subsampling 1x1 will be used, otherwise 2x2 will be used. For this reason you will see a sudden greater reduction in file-size if you change the quality from 51 to 50. So it is not possible in Photoshop to combine a stronger compression (below 51) with clean typefaces. From time to time you also have images completely without color, grayscale images. Fortunately the JPG specification was designed for respecting this and to save images completely without the color channels. Unfortunately there are only a few applications that support this, even Photoshop does not. If you create a grayscale image in Photoshop und save it as JPG, it will always be a color JPG. As you can see in the following table, the potential to save file size is enormous at small image dimensions (think of thumbnails). In the following table I've created a grayscale JPG and a RGB JPG of a grayscale image in the same quality. Even at large images you will save up to 3% file size. Please note: 3% data that is absolutely irrelevant for the presentation of the image. Of course you are able to generate real grayscale JPGs in COD. Also interesting are images with included color profiles or other color models like the CMYK color model) you want to prepare for usage on the web. In the browser those images look ugly while they look fine in Photoshop or other image viewers. Only few of the "great JPG compressors" are able to handle this. COD converts those images to the standard sRGB color space and dicards the color profile to produce a smaller file with a clean display. Now things will get a little bit odd which has led Xiph.org’s researcher Tim Terriberry to call JPGs "alien technology from the future". For reasons of clarity and comprehensibility I will skip the things that are difficult to understand like formulas. Now the image gets splitted in 8x8 sized pixel blocks, where every block will be compressed by itself without any relation to the compression of any other block. Furthermore it was assumed that there are just minor changes in an 8x8 pixel block so there should be soft contrasts. That is important because it was realized that all information data in an image can be expressed by putting cosine curves on top of others. And the smaller the amplitude of a curve the smaller the value you have to save. While developing the JPG file format 64 different cosine curves were determined that could express the pixel values of a block. The conversion of pixel intensity values to pattern intensity values is called Discrete cosine transform (DCT). After that you no longer have 64 wildly mixed pixel intensity values in a block, but values sorted by detail complexity. The value at the upper left corner contributes most to the appearance of a block. And by layering one pattern after the other from the upper left to the lower right corner the image gets more and more details. The more patterns from the lower right are discarded, the coarser the image gets. And that is done by JPG at decreasing quality. At low quality you can perfectly see, that the blocks are just generated from the patterns of the upper left corner from the DCT patterns table. Additionally this image shows very well where the typical block artifacts come from. But what does it mean if you set the quality slider in your prefered graphics editor to 70 (at a scale from 1-100)? Or to 7 in a different program (at a scale from 1-15)? Or to "Aggressive"? How does it work that patterns of the lower right corner are getting discarded? By using the patterns table you now have intensity values for the corresponding patterns that represent the current 8x8 pixel block. Assume you have a 148.765 as value for the second pattern at the upper left corner. You can clearly see that the values get bigger as you get further into the area of the details in the lower right corner. Because rounding errors at restoring the initial values are getting bigger at bigger quantization values, the details are slightly different to the original image. But that's OK, because our eye can't see differences in busy areas of the image or can't classify them as correct or wrong. In the normal case this table should be used at a quality value of 50. And it should be adjusted by a formula for a quality value of 30. Now you shouldn't forget that this quantization table is just a suggestion und the generated quantization table is embedded in the JPG anyway. So every manufacturer of graphics software or cameras creates its own "better" quantization tables and uses them. 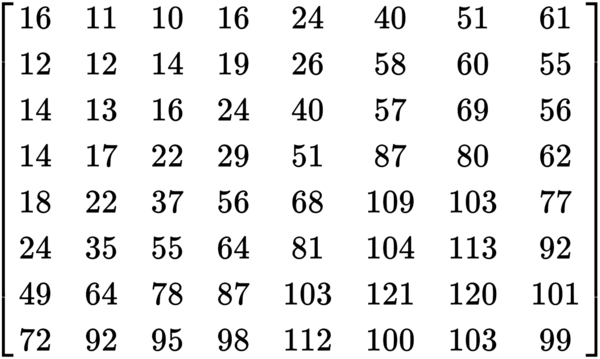 And also the formula to derive a quantization table from quality factor 50 will be different for every manufacturer. Maybe they have special tables for specific quality levels or even specific image content. In a nutshell: The quality level of a JPG is only a handy setting offered by the manufacturer for its quantization tables and has no relation to the JPG specification. So it is not comparable between different programs. 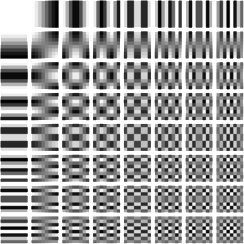 There are more than sextillion possibilities to create a JPG by quantization tables. So to compare the results from different programs you could create JPGs with the same size and decide which seems to have the better quality. Or use metrics to estimate the perceived quality like SSIM or PSNR. But keep in mind that those metrics are far away from simulating the human perception... which is absolutely subjective by the way. This step encodes the converted values after the quantization. Here there is nothing what is relevant for the comprehension of the JPG algorithm. The data of a JPG file can be structured in two different ways. The first possibility is called "Baseline", which arranges the data of the 8x8 pixel blocks one after the other. When viewing large image files you will recognize the line-by-line display in the browser. The second possibility is called "Progressive" which put the values of the coarse patterns at the front and the details at the end. When viewing large image files you will recognize, that you will first see a coarse image that will get better and better. This page claims there is an estimated 75% chance to get a smaller image with "Baseline" encoding if the JPG is smaller than 10 kB. And a 94% chance to get a smaller image with "Progressive" encoding if the JPG is larger than 10 kB. I have positive experiences with those values so COD uses "Progressive" as default value. Aside from the fact that the user experience is a lot better. This setting does NOT change the quality of the generated image as I've read occasionally. 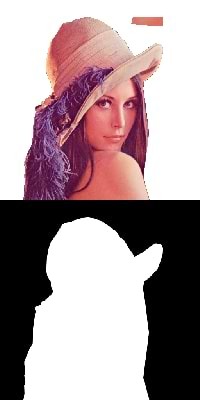 The most famous artifacts of the JPG compression. They appear because every 8x8 px block is compressed for itself. By the usage of the quantization inaccuracies in the rendering occur at the edge of a block. The right edge of a block could be slighlty darker while the left edge of the next block could be slightly brighter. A visible edge appears. Seen often if detailed and flat areas occur in the same 8x8 px block because the JPG algorithm has to use a pattern of the lower right corner which can't be turned off for the flat part. Now since we know the way the JPG is built, we can utilize some peculiarities to reduce the file size apart from the quality settings. That is probably not interesting for those people among you that just want to save photographs, because the image content might get changed. But for the others, who are forced to keep file size limits, this could be very interesting. Of course it's possible to argument with the quality too: If you use those tricks, you could increase the quality to get an image with the same size but with less block boundary artifacts and less mosquito noise. 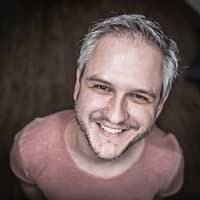 To be able to create a high quality JPG, your source image also has to be of technically good quality and should not have been compressed with a Lossy algorithm like JPG before. If you create a JPG from high quality material, it will be smaller und will look better than a one created from a heavily compressed JPG. It is best to create a PNG (lossless image format) from your image composition and to upload this to COD. In most cases it should also be ok to use the images from your digital camera, because cameras are usually saving JPGs in high quality levels. You should be sure to have sharp edges at the edges of your 8x8 pixel grid in order to help the JPG algorihm not to take patterns from the DCT patterns table that are intended for the usage of flat areas. At the following image the typeface and the box where shifted down by 1px to align the elements at the grid. The aligned version is not just a lot smaller, also the box and the typeface are a little bit sharper. Maybe you have to adjust the dimensions of the elements or to shift them independently. But it's worth it. As you have seen above in the context of low-contrast areas (so "smooth" information changes) an image can be saved smaller the lower the contrasts in the individual channels are. That is the reason a JPG gets smaller if we reduce the contrast because it lowers the differences of the data in the lightness channel. It is the same with the reduction of the saturation that corresponds to a contrast change in the color channels. How strong you apply those changes is up to you. But you should keep in mind that changes in the lightness channel have more impact than changes in the color channels (as far as file-size and quality are concerned). The both images do not exactly look the same but you save on file-size, because you don't need to save color information in the JPG file. By using a slight blur the data can be represented better by a cosine curve and thus the JPG is smaller. But because edges are getting blurred too and the eye is trained to perceive edges I recommend using the Selective blur (available in COD). This algorithm blurs only flat areas but not edges. It's something like the counterpart of the Unsharp mask that sharpens an image. This great feature of COD allows to save specific areas of your image in a different quality than the others. Actually this is not supported by the JPG specification but with a little trick it is possible nonetheless. This is really useful in order to sharpen elements that are in the visual field of the viewer while unimportant elements can be left with a lower quality. In the following image the background has a lower quality than Lena herself. But because human faces attract the human perception, you don't notice. I hope this article gave you a little insight into the functionalities of the JPG algorithm and maybe you've learned how to save a few more bytes on file size. If you still have questions, suggestions or wishes, drop me a line. Open lena image in compress-or-die.com. Then please share it with others!